IRVINE, CA--(Marketwired - December 07, 2015) - American Industrial Systems, Inc. (AIS), an innovator and the leader of Industrial HMIs, Touch Panel Computers, Industrial PCs (IPCs), Industrial Box PCs, Industrial DIN-Rail PCs, and Industrial Thin Clients, announces their extensive portfolio of Smart Industrialized HMI touch panels which includes the Premium, Standard and Compact Series. They are designed and engineered to support machine builders and end-users in connecting control, automation systems, networks, back-office systems and people to the Industrial Internet of Things (IIoT) and Industry 4.0 applications. Industrial IoT, also called Industrial Internet or Industry 4.0, is a network of physical devices, sensors, and machines connected to the Internet for effective communication of data. 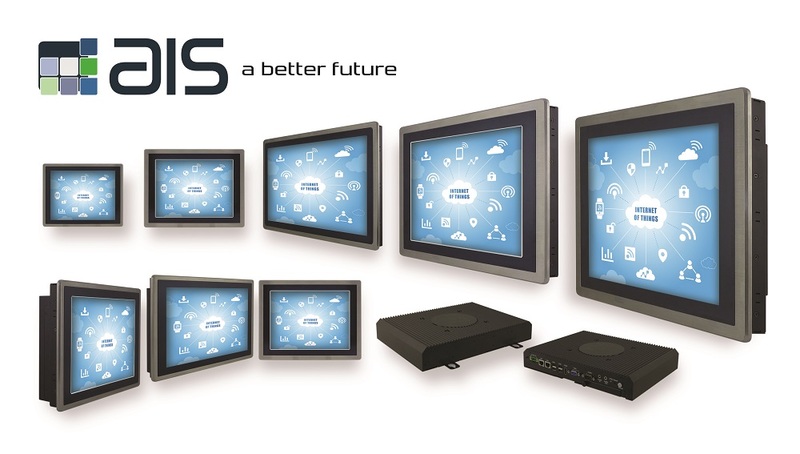 AIS's Premium, Standard and Compact Series of PC-based HMI touchscreens enable IoT and M2M connectivity and allow manufacturing companies to monitor and control industrial operations from local and remote plant and facility locations. Thanks to their powerful processing capabilities, advanced features and a plethora of connectivity options, AIS's Premium, Standard, Compact Plus, and Compact Smart family of HMI touch panels facilitate advanced analytics, which is applied to the vast amount of data generated by connected devices that help in making intelligent decisions with powerful insights. Industrial IoT and M2M ready touch panels from AIS help enterprises to reduce unplanned downtime, improve machine efficiency, optimize business processes and improve working environments. AIS's Smart HMIs open architecture supports embedded x86 platforms and enables the use of off-the-shelf hardware and software and will work with a variety of operating systems. Depending on which model is selected (Premium, Standard, Compact Plus, or Compact model), AIS's Industrial Panels come standard with pre-installed Windows options. They will also allow the use of open technologies, such as Active X, Extensible Markup Language (XML) and .NET to visualize documentation and videos, and to listen to audio messages. The ability to open, edit and save spreadsheets, documents and Adobe® files is another capability of AIS's open architecture, Smart HMI touchscreens. Furthermore, AIS's next generation of Smart family of ruggedized, industrialized touch panel HMIs allow compatibility with Web, PLC, HMI, SCADA and MES applications. AIS's open platform also ensures network security and enables users to leverage new TCP/IP-based Networking, HMTL 5, Web Browsers, Web-enabled HMI/SCADA, Industrial Automation, Field Mobility, M2M, M2H, Industry 4.0 and IoT applications. Premium Series HMI Touch Panels: Powered by an Intel® Core™ i7-4650U Processor, the Premium HMI touch panel is AIS's flagship intelligent, embedded industrial computer touchscreen. It's blazing fast and ideal for SCADA and other large data processing and analytics applications. Standout features include complete system modularity for easy service, field service, expandability and future upgradeability. Available in both single touch and multi-touch screens, they offer display screen options ranging from 15" to 24" -- also available in a wide selection of interfaces and gesture-based touch panel solutions. Standard Series HMI Touch Panels: Equipped with NEMA 4X/IP66-compliant stainless steel front bezels featuring a corrosion and chemical resistant surface, the Standard is suitable for a wide range of industrial and commercial application. Similar to the Premium Series it offers system modularity but also features a removable SATA hard drive. Loaded with an Intel Atom Processor E3845, the Standard HMI comes in touchscreens ranging from 12.1" to 24" in single touch, and 15.6 to 21.5" in multiple touch model displays. Compact Plus Series HMI Touch Panel: Although it is AIS's most affordable intelligent HMI for IIoT, M2M and M2H applications, HMI functionality is common across the entire range of Smart PC-based Industrial Panel Computers (IPC). Integrated with an Intel® Core™ i3 - 4010U Processor, the Compact Plus is ideal for OEM Machine Builders needing to equip their machines with open, touchscreens for M2M, M2H and other applications requiring a gateway to other industrial devices and the internet. Manufactured in a lightweight, aluminum die cast housing for durability, AIS's Compact Plus HMIs are available in 12.1" to 21.5" in both single and multi-touchscreens. Headquartered in Irvine, California, USA, American Industrial Systems, Inc. (AIS) offers in-house electronic and mechanical design, software development, manufacturing, production and quality control services. Offering one of the widest ranges of industrial computing solutions, AIS open platform control and monitoring solutions are available in a multitude of configurations for industrial, building automation, food & beverage, oil & gas, military and marine applications. The company's HMI solutions are key enabling technologies for the Internet of Things (IoT), Industrial Internet of Things, (IIoT), Machine-to-Machine Communications (M2M) and Industry 4.0 applications. AIS is fully committed to empowering, improving and delivering turnkey HMI, control, monitoring and display solutions for OEM, ODM and end-user customers. AIS is an ISO 9001:2008 certified supplier and manufacturer of rugged computers and displays, and received completion of the International Traffic in Arms Regulations (ITAR) registration from the Directorate of Defense Trade Controls (DDTC). For more information, visit: www.aispro.com, email: sales@aispro.com or contact: 1-888-485-6688.